On 21 March 2017, UNU-IAS co-organized an International Symposium on Coral Reefs in Crisis, hosted by the Tara Expeditions Foundation. 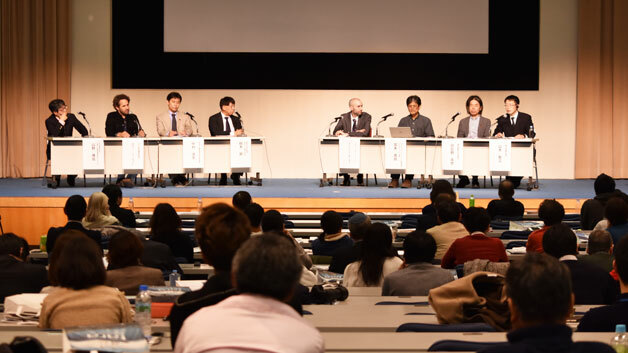 The symposium was held during the first stopover in Japan that the organization has made since it was established 12 years ago. Experts discussed the current conditions of coral reefs and individual actions to protect marine ecosystems. Opening remarks from UNU-IAS Director Kazuhiko Takemoto stressed the importance of partnerships among different stakeholders to achieve the Sustainable Development Goals (SDGs) adopted by the UN in September 2015. He highlighted UNU’s contribution to meeting these goals, in part through promoting partnerships forged by the Global Environmental Outreach Centre (GEOC). In the keynote speeches that followed, General Manager of Tara Expeditions Romain Troublé and Assistant Professor from the University of Tsukuba Sylvain Agostini introduced Tara’s various research and educational activities with different partners. Tara collaborates with researchers, artists, and companies to explore how climate change, ocean acidification, and other factors impact coral reefs. During the panel discussion, UNU-IAS Research Fellow Philip Vaughter highlighted the importance of environmental education for adults. He also pointed out that different ministers should work together to strengthen environmental education focusing on enhancing ethics. The symposium closed with the remarks of Troublé who highlighted individual actions to protect marine ecosystems. He stressed the importance of sending out messages about environmental issues, understanding what is happening on the ground, taking action with passion, and responsible consumption by choosing sustainable products.